Leta��s get straight to the point. If you like pork, you ought to go to this gastro pub to try the Naga Pork from their new menu. Sure, theya��ve done away with the bamboo shoot in the curry because most people find it too pungent, and yes the bhoot jolokia (Naga chilli) is tempered down a bit, but it retains beautiful flavour, and that works perfectly well for us. Set on a bed of noodles, this delightfully spicy dish is a must try. The aam aadmi eggs, which is probably an upgraded version of the famous Kejriwal eggs that too many restaurants seem to be serving these days, is a curious starter. A thick slice of toast with spiced tomatoes, onion seed chutney, cheese spiked with green chillies, and eggs, tamarind chutney, deep fried potato straws (sali), with Goan chorizo. Thata��s quite a bit in one dish but all the flavours come together well. Sharing this one is a good idea. 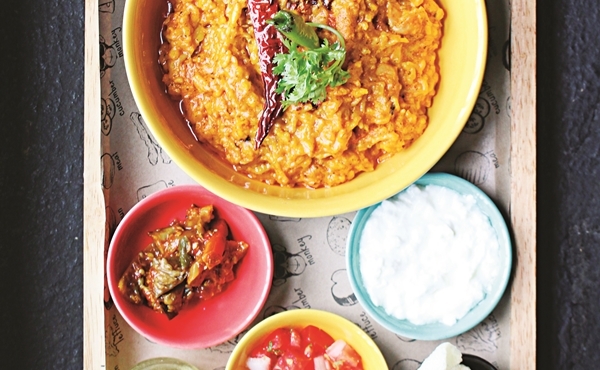 Did we mention the dal pakwan? A simple Sindhi breakfast food, the MoBar version resembles a chaat. The crisp pakwan (spiced dough, flattened and deep fried) is topped with semi-dried chana dal and garnished with chutney, dried mango powder, and slaw made with radish. Crunchy, sweet and spicy, and very Indian a�� this one would be so good with beer, or even rum for that matter. And if youa��re really hungry, comfort food is right at hand. The butter chicken khichdi will get rid of your blues. They also make a vegetarian version with paneer, but word has it that the one with chicken is more popular. Get a portion of the laal maas phulka tacos a�� a nice desi version of tacos, and Mrs Yvonne Pintoa��s prawn pickle with idlis. That pickle is to die for. Finish the meal with Monkey Bara��s ode to the DBC (death by chocolate); you will be stuffed, but you wona��t die.